Background: Carbamazepine (CBZ) has complex pharmacokinetic properties leading to fluctuation in plasma level, which requires routine therapeutic drug monitoring (TDM) to ensure its efficacy and prevent adverse effects. The objective of this study is directed towards developing and validating a simple, precise, rapid and highly sensitive liquid chromatography-mass spectrometry (LC/MS) technique for measuring CBZ concentration in human plasma of epileptic patients in routine TDM. Methods: The blood samples of 103 epileptic patients were collected for therapeutic monitoring of CBZ with validated LC/MS assay. 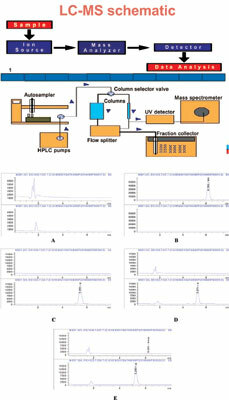 The analytes from plasma were extracted with methanol by simple protein precipitation method. The Agilent 1100 LC/MS system was used. The ammonium acetate 5mM: methanol (40: 60 v/v) and diamonsil C18 (150mm×4.6mm, 5µm) were used as mobile phase and analytical column for the separation of analyte, respectively. The temperature of column was 25°C and the rate of flow was set at 0.8 mL/minute. International Conference on Harmonisation (ICH) guidelines were used for the validation of the method. Results: The stated LC/MS assay displayed good linearity in the range of 5-1000ng/ml and linearity equation of calibration curve was y= 2.44516x +0.00348175 with a correlation coefficient (R2) of 0.99881. The lower limit of quantitation (LLOQ) of the stated technique was observed at concentration of 5ng/ml. The linearity, recovery, accuracy and precision, specificity and stability results were within the acceptance limits of ICH guidelines. Conclusion: The simple, precise, rapid and highly sensitive LC/MS technique was developed and validated and successfully applied in TDM of 103 epileptic patients who were using CBZ. Besides TDM, the stated method can also be applied in bioequivalence, pharmacokinetics and pharmacovigilance studies. Antiepileptic drugs, carbamazepine, epilepsy, LC/MS, therapeutic monitoring, TDM.